The TMB, the company charged with operating and maintaining the Metro system in and around Barcelona, have over the past few years done a sterling job in making the system wheelchair and scooter friendly. In addition they have added facilities to assist the hearing and sight impaired, all to their credit. There are however some issues that need to be addressed in respect to what is publicised regarding wheelchair and scooter accessible stations as what is perceived to be accessible is often not the case. It appears that the specially introduced ramps on platforms, particularly L1 (Red), were purchased as a job lot, one size fits all, without taking into account platform heights or cambers relative to the trains themselves. This means that whilst the majority do indeed facilitate entry and exit to the very modern trains, there are some where trains lean away from the platform creating a sizeable gap and also in the process of leaning creating a difference in height between ramp and train of around 10 to 13 centimeters. In short making access impossible for power chairs and scooters, with assistance manual wheelchair users should have only minor problems in the main. 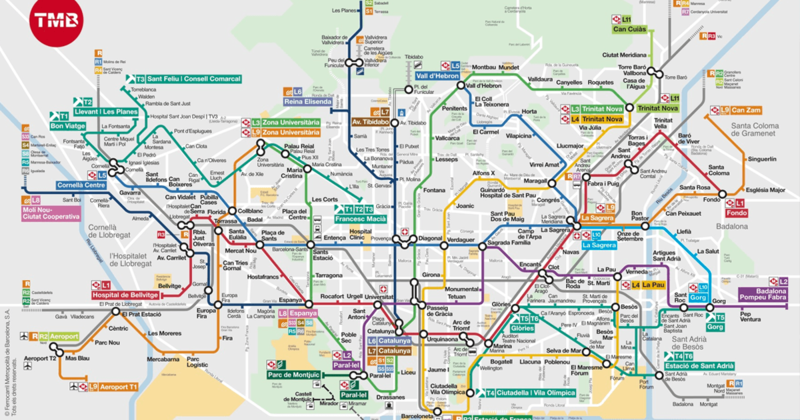 For those staying in the heart of Barcelona the line to use without fear of access problems is L2 (Purple) as it is totally accessible for everyone and in particular it is the line to use from the City center for those wishing to visit La Sagrada Familia. For all other lines its worth bearing in mind that many stations do not yet have lifts. So although you can access a line at one station you may not be able to exit at another….what fun:-) If you are not a fan of metro systems then consider taking the TMB bus service as it is excellent, 100% wheelchair accessible, has braille on the ‘call for stop’ buttons, destination voice announcements and messaging monitors for the hearing impaired. Above all, do come to Barcelona to experience this amazing City, one of the most accessible in Europe.